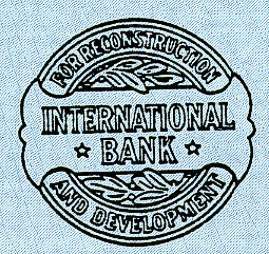 Beautifully engraved SPECIMEN certificate from the International Bank for Reconstruction and Development dated 1989. 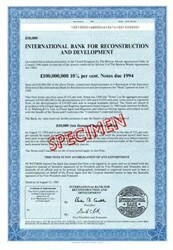 This historic document was printed by Thomas de la Rua and Company Limited and has an ornate border around it with a vignette of the company logo. This item has the printed signatures of the Company's Officers and is over 24 years old. Certificate Vignette The World Bank Group�s mission is to fight poverty and improve the living standards of people in the developing world. It is a development Bank which provides loans, policy advice, technical assistance and knowledge sharing services to low and middle income countries to reduce poverty. The Bank promotes growth to create jobs and to empower poor people to take advantage of these opportunities.